Oh em Glossy! You know with every month I just get more and more excited by the delivery of that black and white packaging that seals the beautifully presented Glossybox. Realising I receive it before the masses as a Press Box also gets me even more excited as I can offer the first sneak peek at what’s in the box this month. 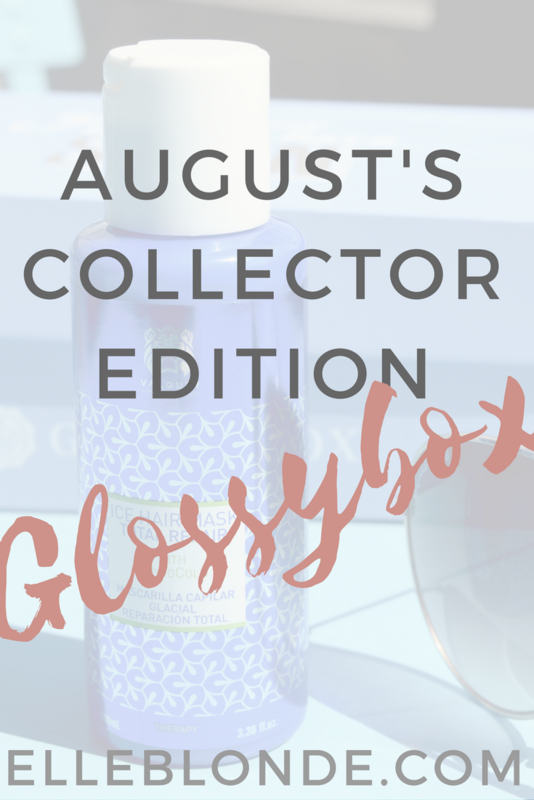 Last month was by far my favourite thus far, let’s see how August’s Glossybox compares. The second Collector’s edition for the Summer months is all about ‘Girls just wanna have Sun’ and that’s what we are going to do this Summer! Opening up the gorgeous powder blue box and pulling on the gorgeous white hand tied ribbon I revealed 10 items! Woah. My magpie stare caught sight of the live.laugh.celebrate palette which had rolling pink, purple, orange and green beads on the top of the palette. Not going to lie I lost a good 5 minutes just playing with this. Rolling the beads around. So therapeutic. Upon opening the palette has four spaces to create your own mix of colours. 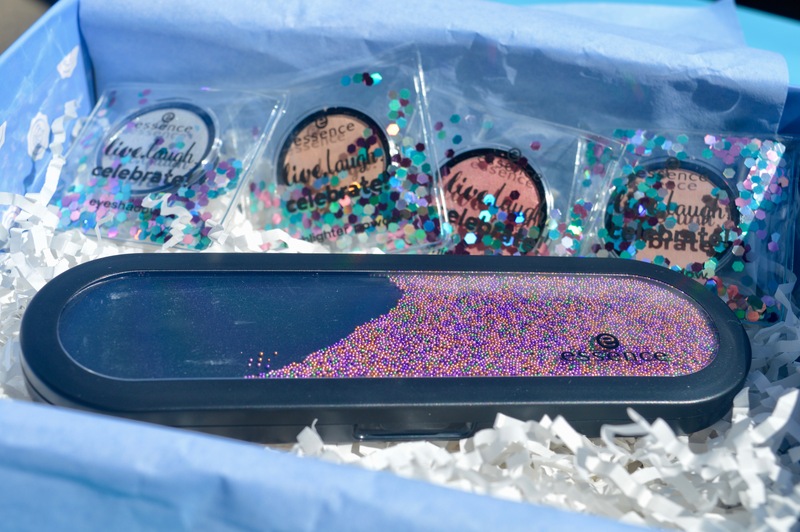 In this month’s Glossybox the sparkly packaging contained two eyeshadows in T.G.I.F and It’s my Birthday. A shimmer blush in Rhythm of the Night and a highlighter powder in My Special Highlight. The palette is priced at £1.50 and the pressed powders are priced at the same price at £1.50 each. A great value palette to throw in your handbag for a night out! 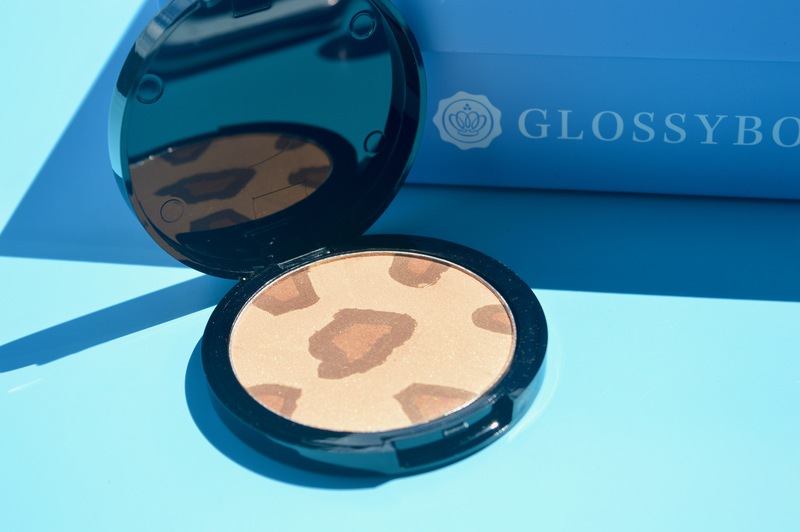 As always with each Glossybox I always choose my ‘hero product’ of the box and this month it’s the Model Launcher Safari Sun Bronzer (£16.50) full sized bronzer. Girls you know Summer isn’t complete unless you’re swimming in shimmer. This talc-free, mineral enriched formula is amazing. It comes in a fantastic safari print pressed powder which if you’re like me you’ll not want to use as it’s so pretty! Sweep and swirl all the colours together and place it where the sun naturally shines on your cheek bones, bridge of your nose, over your forehead and chin. The Glossybox is definitely worth purchasing just for this hero product alone. Per-suede me another subscription box is better? 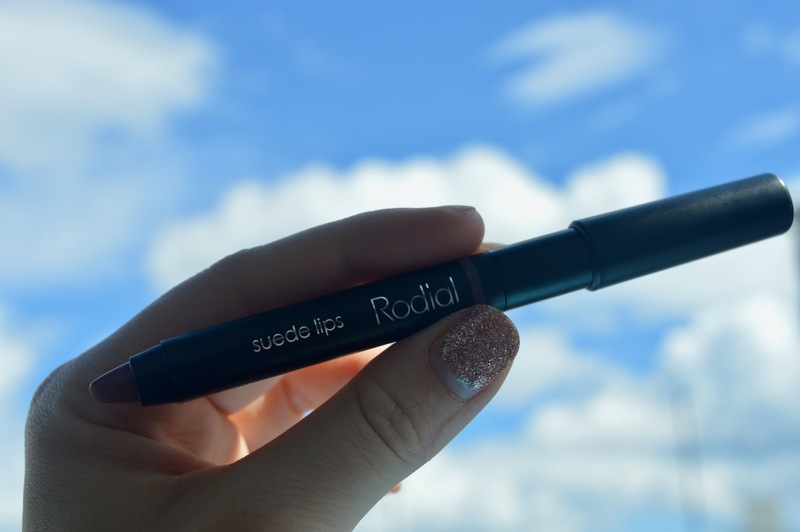 Rodial is one of my favourite brands at the moment and if you remember April’s box we trialled the Glam Lash XXL Mascara which was nabbed by a makeup raiding Mother, who subsequently went on to purchase a full sized product. This month sees Suede Lips, an intense, matte and moisturising lip pencil (£22) which contains hydrating vitamin E. This can be used all over the lips to give a bold or subtle look depending on how you apply. In the shade Big Apple this is a colour I know I’ll wear time and time again. 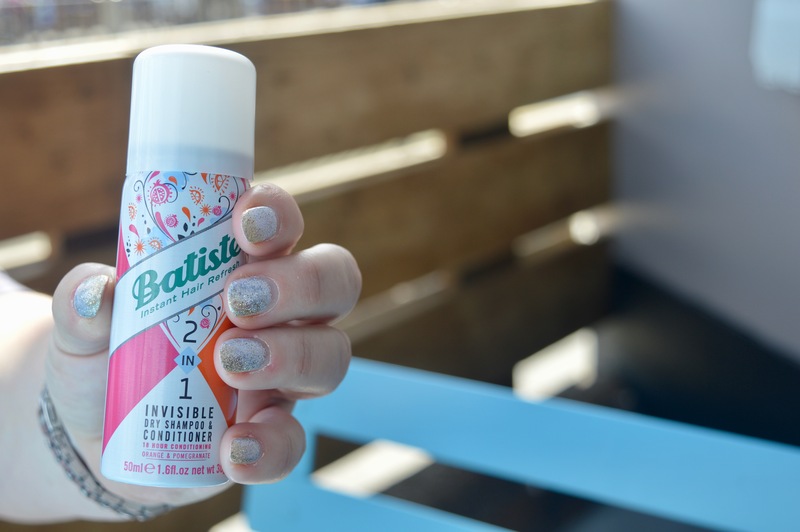 If you haven’t seen Batiste before then where have you been? They’re all over at the minute with the launch of their new 2in1 Dry Shampoo & Conditioner Orange & Pomegranate. With dry shampooing being redefined you’ll absolutely love this freshly scented spray which not only refreshes the root and is great for those of you with dry, coloured or curly hair. This travel-sized can is perfect for throwing in your hand luggage for freshening up, or ideal for the mud and filth of festival life. Still got to look sassy ladies right? 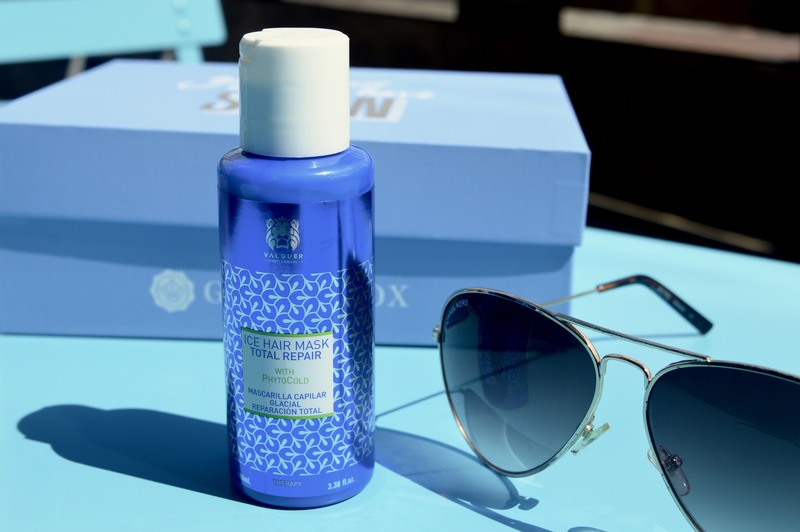 The penultimate item in this month’s Glossybox, Ice Hair Mask. Total Repair. I’m really into hair masks at the minute. I’ve been using Marilyn from the new Lush launch so I’m excited to give this a try. The one-of-a-kind hair mask has a cooling effect which powers up the macadamia oil to make it even better at taming and hydrating your hair. After you shampoo your hair switch your conditioner for the Ice Mask. Use once or twice a week and massage gently into damp (not soaking) hair for 3-5 minutes before rinsing. 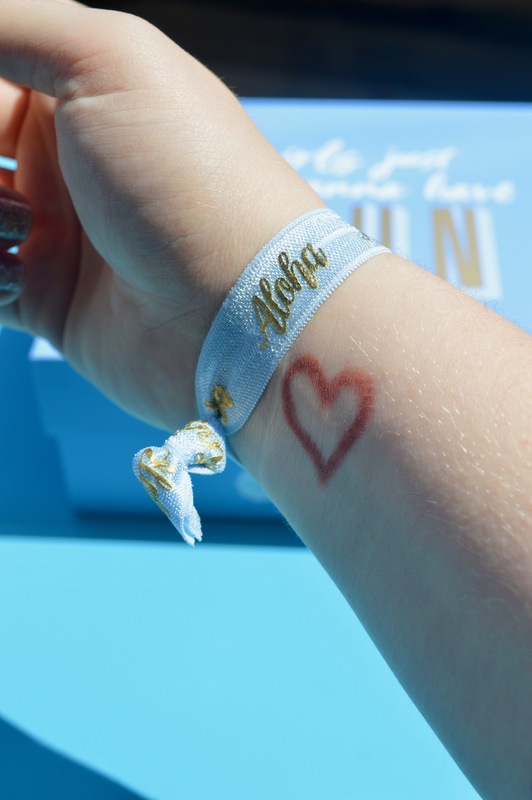 Last but not least Purelei’s Aloha bracelet with gold lettering which also doubles up as a hair bobble. Don’t tell me that Glossybox hasn’t thought of everything for this month’s box! I had one of these bobbles in Ibiza a few months ago and it was a God send. Not only does it look cute, it’s incredibly handy for throwing your hair in a top knot on top of your head. The Girls Just wanna have Sun box has been my second favourite Glossybox to date. Last month’s Hello Summer was the best ever. Grab yours FOR ONLY £6 before the limited collectors’ editions sell out here. Disclaimer: This item was provided complimentary, all views are our own. Read more about disclosure here. Next article6 things you must do to make more money from your blog. I like to receive the box and all products of your GlossyBox are amazing. Have a lovely day! So glad you liked this post! I absolutely love August’s box, think you still have time to grab July’s which was my favourite by far!!! I’ve never tried any of these subscription boxes, but have always been curious about… great box! I got my August Glossybox today. Just a question about the bronzer, it says it’s talc-free, however, when I look on the back of the bronzer, the second ingredient is Talc. Am I missing something here?